I read a wonderful article in the New York Times Sunday Review, “What’s the Best Restaurant if You’re Over 50?”. I read it with interest because, well, I’m over 50 and I love going out to restaurants. The basic message of the article was that, when you hit a certain age, you’ve gone beyond the desire for bling and sophistication. Peers my age want comfort, quiet and consistency, a place that we can frequent. We’re now at an age when we don’t need to impress anyone and we want to visit a place that loves us. As I was reading the article, it dawned on me how much of this applies to my business. Whether we explicitly stated it or not, since day one we’ve tried to take care of our clients in a way that makes them feel appreciated. That each time they meet, call or email us, the response they get makes them feel like a regular at a restaurant that respects and values them. 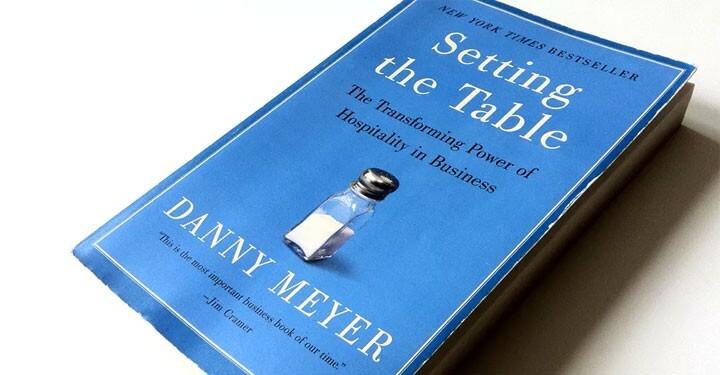 Danny Meyer, the owner of Union Square Hospitality Group, wrote “Setting The Table”, the best business book I’ve ever read. I can really see how his philosophy is practiced in his restaurants, especially at Gramercy Tavern. It’s my favorite restaurant because, in addition to having excellent food, I get a great total experience every time I go there. I can hold a conversation, not sit cheek to cheek with strangers and I can always count on a high level of service from the wait staff. You can feel that they care. After being in business for almost 25 years, I have, hopefully, matured as a businessman. I know what we offer to our clients, a constant push to find solutions that will work for them. : number of overseas trips every year for sourcing and quality control, the never-ending search for materials and techniques for newer and better ways to make the best bags at the lowest cost, working day and night to stay in touch with factories and shipping companies to make sure everything is completed on time, in correct quality and delivered on schedule. We’ve lost some clients to newer, more “cutting edge” and hip competitors, but more often than not they come back to us. I like to think that my clients know the value we give and perhaps realize they’re missing it when they leave. It’s human nature to want to be valued, no matter what age. It’s not an easy thing to keep that level consistently but we know it works because almost every client is a repeat client. I get to work with my smart, hard-working and creative wife! My staff amazes me with their dedication to their work and our clients. We get to make stuff that people use because, well, it’s useful. We all care about doing well and taking care of our clients. With all this going for me, giving great service becomes routine.